Last night we attended the 2015 ISPA awards (also known as the ‘UK internet oscars’) and we are delighted to announce we walked away with 2 ISPA’s! For the 3rd year in a row we topped the Customer Choice Award , as voted for by customers of the companies nominated, so a massive thanks to every one of you for voting and providing some amazing comments about our service. Winning this award 3 years in a row is a massive testament to our focus on customer service and just makes us want to do even better over the next 12 months! We also came away with the Best Business Customer Service award for the second time, the judges highlighted our friendly support and high satisfaction as the key reasons for our win. As always we aren’t ones to rest on our laurels, so feedback is always welcome, at the bottom of every ticket you can rate your response, please let us know how we are doing. 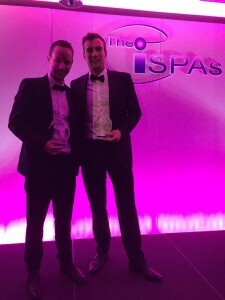 Image: Jacob and Paul with ISPA Awards.